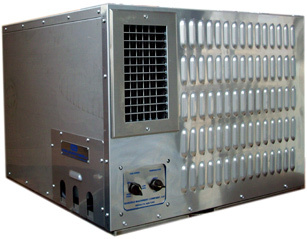 For an overview of Aero Conditioner Company's harsh-duty, industrial air conditioning systems, Click here. Aero Conditioner Co. (ACC) designs its industrial air conditioning systems for most hazardous classes, groups, divisions and zones. We build all of our hazardous-area (explosion-proof) equipment to tolerate and perform well in the same severe conditions as do our regular harsh-duty units: dusty, dirty, corrosive, hot (even very cold environments), high altitude, super humid and otherwise extreme-pressure to assure long life under severe conditions.